We are now 1000 backers strong, 20% funded to the $200k goal, and have 15 days left to make that goal. A few of you have already been spreading the word in places like reddit and your own blogs. If you are an avid reader of or have accounts in places like slashdot, reddit, io9, imgur, etc, you might consider posting some updates to increase our visibility. We are doing some similar things, and our team is working hard on the hardware to light this version of the CAT engine up late this week. We are super excited about First Plasma in this device! 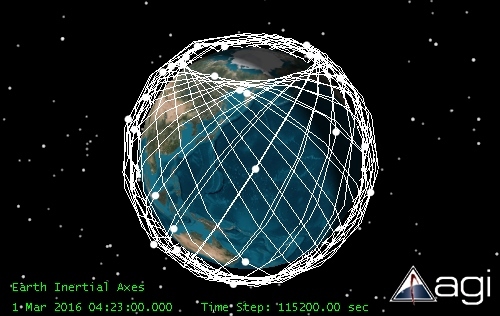 PS: Attached is a graphic of a mesh network in low Earth orbit that shows 38 CubeSats moved into position by CAT engines, starting from a single initial orbit and launch vehicle. This global CAT network would have more ground coverage than the 6+ billion dollar constellations like Iridium, GlobalStar, and Orbcomm. Agreed. If I had the money I'd fund the entire project myself with the mere insistence that my name would get 18 point font on the gold plated panel. Unfortunately I lack anything resembling said funds, and most of kickstarter is a little more selfish. Above all kickstarter is an investment platform, and while charity is great, most backers expect a palpable return on their investment. While my name engraved on a probe that will be headed into deep space is more than enough for me, most others expect more of an immediate benefit. If this project fails to meet its funding goals (which, lets be honest, is likely barring a massive surge in the press), I'd highly recommend you guys re-launch it with a more backer-oriented reward. Send one to a specific planet/make a fly-by and allow backers to take/request one photo of a specific region, for instance. Just spit-balling (I have some inkling of how complex such a task would be), but IMO projects like ARKYD succeeded because it was so public-oriented. While space-nerds like myself gravitate towards projects like CAT, most backers simply won't. But despite all that pessimism, however justified, I've got my fingers crossed for you guys. Wish I had more than $60 to give, hopefully you can pull off a funding coup in the next 13 days. Space exploration, on whatever scale, needs much more support than it currently enjoys IMO, and I hope whether via kickstarter or other funding you guys get to make your contribution. For what it's worth, I've already spammed every forum and social network I'm a member of with this project. Good luck! This is a difficult project to get funded. Most succesfull funded projects are something that delivers an endresult. This project delivers an intermediate result from the perspective of the crowd. The crowd cannot do anything with the engine once its created. There will need to be other projects that will need crowdfunding themselves afterwards that build a cubesatellite that wil actually do something. Take a picture, go somewhere, stay longer in orbit while performing some task, etc. with a cubesattelite using this engine. So it might be good to point out even more examples of endresults, or already anounce partnerships with people planning to do such projects. A crowdfunded cubesatellite using this engine that sells a picture of anywhere on earth from space to the crowd. That delivers an andresult to the crowd. A cubesatellite that will orbit the moon and take pictures of it which then will be published to the crowd. Anything goes really, but the closer you are to selling an endresult to the crowd the more chance of success the project will be funded. I already backed and see the value in this even as intermediate result. But keep examples of endresults like this coming. You'd need a team of at least 10 people fulltime for the remaining days to spam this project around the world and to come with new endresult examples daily. I've already spammed it around friends and colleagues, but the most heard remark is "what can you do with it? just go to space, thats all? ".